This easy no-cook dessert can be ready in less than 30 minutes, making it perfect for entertaining. 1. Halve the pomegranates and squeeze the juice from 3 of the halves using a lemon squeezer. Open out the remaining pomegranate halves and separate the seeds, discarding the skin and white membrane. 2. Put the biscuits in a polythene bag and crush lightly with a rolling pin into small pieces. 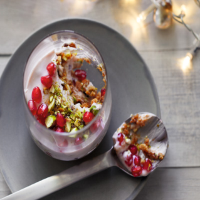 Scatter half the crushed biscuits into 6 serving glasses and add half the pistachio nuts and pomegranate seeds. 3. Put the cream cheese in a bowl with the honey, lemon juice, cream and pomegranate juice. Beat with a hand-held electric whisk until forming soft peaks, then spoon half this cream mixture over the biscuit layer in the glasses and top with the remaining biscuits. Reserve 2 tbsp of the remaining pomegranate seeds and nuts for decoration, sprinkle the rest over the biscuits and top with the remaining cream mix. 4. Decorate with the reserved pomegranate seeds and nuts. If you have time, chill for several hours, or overnight, before serving to allow the biscuits to soften. Skinning pistachio nuts emphasises their brilliant green colour. So if you have time for this recipe, put the nuts into a heatproof bowl, cover with boiling water and leave for 1 minute. Drain and rub between several layers of kitchen paper to loosen the skins. Peel away the skins and use as above. This recipe was first published in Thu Nov 08 13:11:00 GMT 2012.